The Japanese beetle (Popillia japonica Newman) is a highly destructive plant pest of foreign origin. It was first found in the United States in a nursery in southern New Jersey over 80 years ago. In its native Japan, where the beetle's natural enemies keep its populations in check, this insect is not a serious plant pest. White grub phase of the Japanese Beetle life cycle is very destructive to turf grasses. 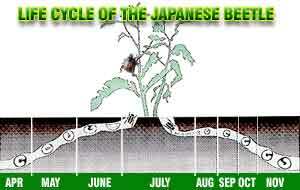 Pupa stage is the dormant phase of the Japanese Beetle life cycle. Both as adults and as grubs (the larval stage), Japanese beetles are destructive plant pests. Adults feed on the foliage and fruits of several hundred species of fruit trees, ornamental trees, shrubs, vines, and field and vegetable crops. Adults leave behind skeletonized leaves and large, irregular holes in leaves. The grubs develop in the soil, feeding on the roots of various plants and grasses and often destroying turf in lawns, parks, golf courses, and pastures. Today, the Japanese beetle is the most widespread turf-grass pest in the United States. Efforts to control the larval and adult stages are estimated to cost more than $460 million a year. Losses attributable to the larval stage alone have been estimated at $234 million per year— $78 million for control costs and an additional $156 million for replacement of damaged turf. The adult Japanese beetle is a little less than 1/2" long and has a shiny, metallic-green body and bronze-colored outer wings. The beetle has 6 small tufts of white hair along the sides and back of its body under the edges of its wings. The males usually are slightly smaller than the females. You are most likely to see the adults in late spring or early summer. During the feeding period, females intermittently leave plants, burrow about 3" into the ground— usually into turf—and lay a few eggs. This cycle is repeated until the female lays 40 to 60 eggs. By midsummer, the eggs hatch, and the young grubs begin to feed. Each grub is about an inch long when fully grown and lies in a curled position. In late autumn, the grubs burrow 4" — 8" into the soil and remain inactive all winter. This insect spends about 10 months of the year in the ground in the larval stage. In early spring, the grubs return to the turf and continue to feed on roots until late spring, when they change into pupae. In about 2 weeks, the pupae become adult beetles and emerge from the ground. This life cycle takes a year. There are no quick fixes that can rid homeowners of the Japanese beetle once it becomes established. Pheromones are the chemicals insects use to find each other. Pheromones can be manufactured and used in traps to monitor the activity of insect pests. The common Japanese beetle trap is the most commonly commercially available pheromone trap. This trap is sold for control of Japanese beetles, but research has shown that the traps capture only 50% — 60% of the adult beetles attracted by the pheromones and more beetles are actually drawn into the area than would normally be present.